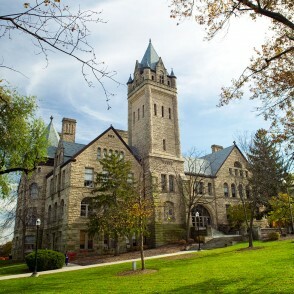 Since its founding in 1842, Ohio Wesleyan has grown to include a beautiful 200-acre campus with 60 buildings and 10 locations on the National Register of Historic Places. We invite you to walk our campus and visit these historically significant sites. An online map of campus is available at owu.edu/map. The best place to start an OWU walking tour is at the beginning. Built in 1833, Elliott Hall is the oldest building on the Ohio Wesleyan campus as well as the oldest collegiate Greek Revival building in Ohio. Elliott Hall was built as a hotel, called the Mansion House, to accommodate guests to the nearby Sulphur Spring. When the hotel was put up for sale a few years later, the Rev. Adam Poe, pastor of William Street Methodist Church, encouraged the citizens of Delaware to buy it in order to found a university. Just west of Elliott Hall is Sturges Hall, a red-brick replica of the wood-sided former hotel. Sturges Hall opened in 1855 as a library. It transitioned to academic space when Slocum Hall was constructed next door. 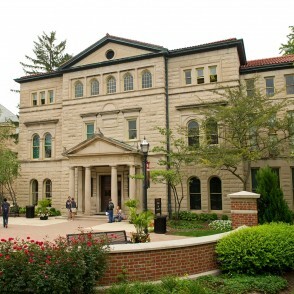 Sitting just north of Sturges Hall, Slocum Hall also was built as a library and opened in 1898. It is one of the university’s hidden architectural gems, containing an eye-catching 70-foot-long by 20-foot-wide leaded glass ceiling not visible from its exterior. 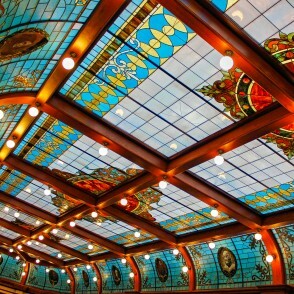 The ceiling features 18 glass portraits of thinkers ranging from Abraham Lincoln to William Shakespeare. A throwback to its library days, Slocum Reading Room still houses bound volumes of The New York Times that date back to 1914. Just north of Slocum Hall, University Hall is an Ohio Wesleyan icon, with a 148-foot bell tower that inspired the title of New York Times best-selling author Richard North Patterson’s thriller “The Spire.” (Patterson is a 1968 OWU alumnus.) 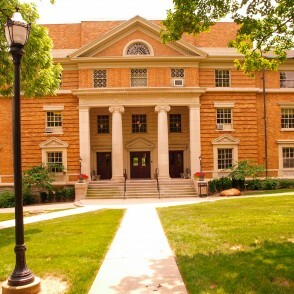 Opened in 1893, University Hall is the home of Gray Chapel, one of the region’s pre-eminent concert halls and performance home of the Central Ohio Symphony. 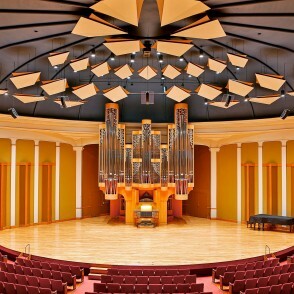 Gray Chapel contains one of the nation’s largest Klais pipe organs — a four manual tracker action organ with 82 ranks, 55 stops, and 4,644 pipes. During the academic year, University Hall’s entry is adorned with flags from every country represented by OWU students. Also in the entry is a large mirror once housed inside the White House. The mirror was a gift from Delaware native and 19th U.S. President Rutherford B. Hayes and his wife, first lady Lucy Webb Hayes. Webb attended OWU for a time, and Hayes proposed to her on the steps of Elliott Hall. 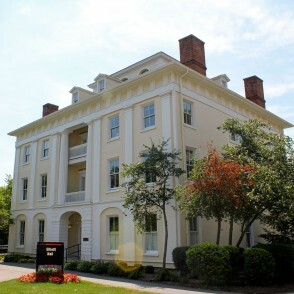 Just east of University Hall is Merrick Hall, named after former OWU President Frederick Merrick. Thanks to an $8-million donor gift, the building was renovated and reopened in fall 2015, after being closed for nearly 30 years. Today, Merrick Hall is the home of The OWU Connection, a program dedicated to helping Ohio Wesleyan students plan travel-learning experiences that expand and enhance their globally focused, liberal arts educations. The third floor of the historic building features an eye-catching 22-foot ceiling. 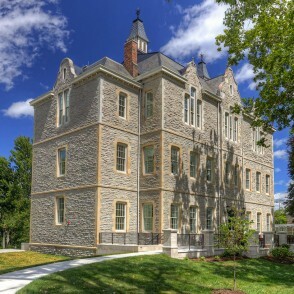 The building, which opened in 1873, was built using materials quarried at what is now Delaware’s Blue Limestone Park. Just east of Merrick Hall, Selby Stadium opened in 1929 and is believed to be the oldest such facility in the nation constructed to, and remaining in, its original Olympic specifications. 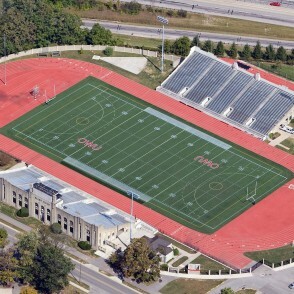 The stadium cost $160,000 when it was built and includes two grandstands that seat approximately 9,100 enthusiasts for OWU football, field hockey, track and field, and lacrosse. The stadium’s outdoor lights and video scoreboard were added in 2010. 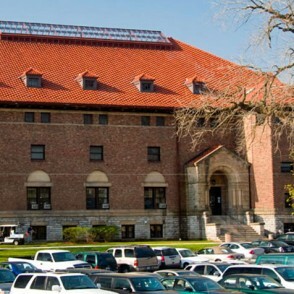 West of the stadium is Edwards Gymnasium, a building central to Battling Bishop athletics since it opened during the 1905-1906 school year. The building stands as an example of the shift to standardized physical education, rather than informal sports and military training that occurred at the turn of the century. The building was fully renovated and reopened in fall 2015. 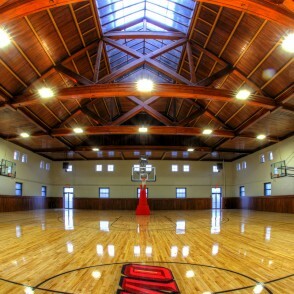 The donor-funded project included repairing its second-floor basketball court and restoring its previously boarded-over skylight. 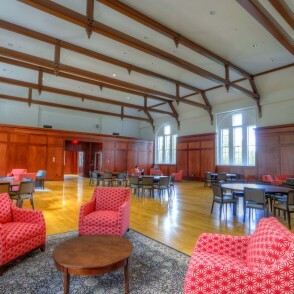 Simultaneously, the university renovated its former natatorium to create the adjacent Simpson Querrey Fitness Center, which houses the state-of-the-art Jannuzi Dance Studio. 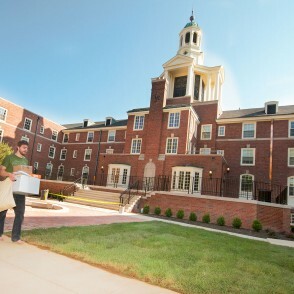 Across campus to the northwest, Stuyvesant Hall is Ohio Wesleyan’s oldest residence hall. When it opened in 1931, Stuyvesant Hall served as a nationwide model for college dormitories with innovative architecture that includes two double-occupancy bedrooms sharing a common bathroom. The building underwent a $14-million renovation in 2011-2012 that included adding energy-efficient heating, cooling, and lighting systems. The work also restored the building’s bell tower and chimes. The Ohio Department of Development awarded the project a $4.2 million Ohio Historic Preservation Tax Credit – the first project in Delaware County to be granted a state preservation tax credit. Since its completion, the environmentally friendly building has earned LEED Silver Certification. Adjacent to Stuyvesant Hall, the Student Observatory is used regularly by the university’s astronomy students. Built in 1896, the on-campus observatory was funded by Hiram M. Perkins, professor of mathematics and astronomy; his wife, Caroline Barkdull Perkins; and his sister, Sarah P. Howard. 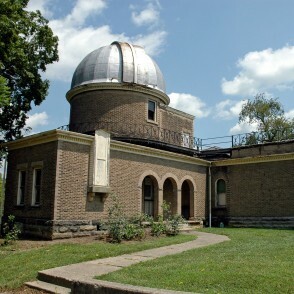 The student observatory originally was called “Perkins Astronomical Observatory,” but it was renamed the “Student Observatory” after the second, larger Perkins Observatory was built south of Delaware in 1923-1924. The student observatory features a 9.5-inch refracting telescope. 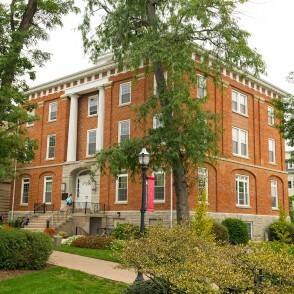 Located on nearby Elizabeth Street, Sanborn Hall was built in 1909 to create a space for both music majors and non-majors to appreciate the art form. The building includes Jemison Auditorium, the site of many free music performances open to the community.